This three-year programme offers an excellent education in a thriving field of science and engineering. The foundation in core physics together with the major areas of physics applied to medicine prepare you for a wide variety of careers inside and outside medical physics, including those in scientific research and industry. Mathematics and Physics required; grade A in Mathematics required. A score of 16 points in three higher level subjects including Mathematics and Physics, with no score lower than 5. Grade 6 in higher level Mathematics required. D3,D3,M1 in three Cambridge Pre-U Principal Subjects. Mathematics and Physics required. D3 in Mathematics required. A,A,B at Advanced Highers (o A,A at Advanced Higher and B,B,B at Higher). Mathematics and Physics at Advanced Higher required. Grade A in Advanced Higher Mathematics required. Successful completion of the WBQ Advanced Skills Challenge Certificate plus 2 GCE A-Levels at grades AAB to including Physics and Mathematics. Grade A in Mathematics required. We have close links to several major teaching hospitals and our staff work side-by-side with doctors and health professionals. With our highly rated research, the expert knowledge of our staff will be of direct benefit in the lectures and teaching sessions you attend. Most medical physics classes are small (fewer than 35 students) providing you with an informal, interactive teaching environment in which you can easily raise questions. The programme is accredited by the Institute of Physics (IOP) providing the first step to chartered physicist status. This programme is accredited by the Institute of Physics. Holders of accredited degrees can follow a route to Institute of Physics membership and the Chartered Physicist (CPhys) professional qualification. Graduates of accredited integrated undergraduate Master's (MPhys or MSci) degrees have fulfilled the educational requirements for CPhys status, while graduates of accredited Bachelor's (BSc) degrees have partially fulfilled these requirements. We offer the option of studying a three-year Physics with Medical Physics BSc or a more in-depth four-year Medical Physics MSci programme. The first two years of study for both programmes are identical and transfer between the two is possible up to the end of the second year. We advise applying for the MSci initially which makes it easier to defer your decision. In the first year, you will receive an exciting introduction to all the major medical imaging techniques employed in modern hospitals, including X-ray imaging, computed tomography, magnetic resonance imaging, ultrasound, nuclear isotope imaging and electroencephalography. In your second year, you will explore the physics of the human body - covering such topics as blood flow, lung function and thermal regulation - and biophysics, in which you will focus on topics including biological polymers, gas and fluid transport processes, membranes and nerve signals. During your final year you will choose three medical physics options from a range and will work on a major project with one of the department's research groups. All second year modules are compulsory. As well as attending lectures, you will also undertake tutorials and practical work, including projects. Projects are conducted in active, well-equipped research groups, often involving collaborations with local hospitals. Many medical physics lectures and projects are taken by a mix of medical physics and medical students, reflecting the multidisciplinary nature of the work performed in hospitals and universities. 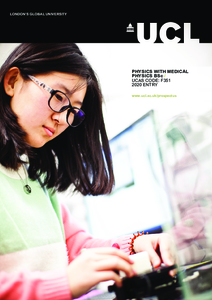 Detailed course descriptions are available on the department website: Physics with Medical Physics BSc. Our degrees are accredited by the Institute of Physics and, as well as a career in medical physics, you will have access to the same wide diversity of careers as with any other UCL physics degree. Physicists tend to be logical, numerate problem solvers and there is a demand for people who have developed such skills in a wide range of careers. If you are focusing on a career in medical physics there are three main paths. Firstly, you can train as a medical physicist in the health service. Secondly, you can follow a career in industry: MRI scanners, radiotherapy equipment, and physiological monitoring equipment, for example, all need researching, manufacturing, supplying and maintaining. Thirdly, you may pursue a career in research, probably initially by taking a higher degree - an MSc or a PhD. Shortlisted candidates will be invited to visit UCL and tour the two departments in which your teaching will take place. During your visit you will be able to view our facilities and meet staff and current students.